Point your browser to Reuters. The Reuters Stock home page appears. Enter the stock’s ticker symbol into the Search Stocks field. Click the Search button and select the company you’re interested in. You see the Overview page for the company whose ticker symbol you entered. Click the Financials tab, then scroll down to the Growth Rates section. Here you can find the growth rates of sales and earnings per share (EPS) in the most recent quarter, called MRQ. Reuters also shows you the company’s earnings growth rate in the trailing 12 months, called TTM. Lastly, you can view longer-term growth rates in earnings and capital expenditures over the past five years. 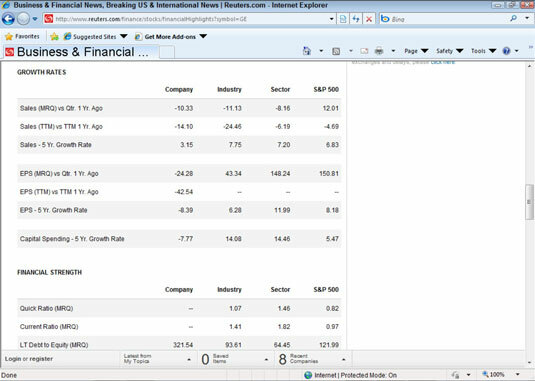 If you’d like to see a breakdown of quarterly growth, MSN Money provides an easy summary screen. First, enter the stock’s ticker symbol into the Name or symbol(s) field and click the Get Quote button. On the new page that appears, click the Financial Results link from the list on the left. In the Financial: Highlights page that appears, scroll down and find the quarter-by-quarter breakdown of the company’s growth. Many professional investors compare each item on the income statement with revenue and each item on the balance sheet with total assets. This lets you find interesting trends, such as whether the company is increasing its spending on research and development or whether the company’s debt is rising. You just need to divide each item on the income statement by revenue and each item on the balance sheet by total assets to perform this analysis.